I planted the guest room a couple of months ago! No quilt on the bed...just lots of whispy leaves. These babies just hatched a couple of days ago and are they cute! They are around 1/4" - 1/2" long. They will grow very fast. Every year I plant fennel or parsley for them. The mother has to fly far and wide to find these tasty plants for her babies. My fennel is lovely and full....just ready for these young ones. The fennel will be stripped bare in a couple of weeks...probably sooner depending upon how many eggs were laid. I don't dare break off a piece of fennel and have a taste now. The fennel recovers just fine after the babies are gone...so I get mine much later in the season. And now for the winners! Also ...here is a preview of the cover of the new cross stitch book. It's our first self-published full color book and we are excited. It has 36 pages and lots of color pictures for you to enjoy! There are 13 stocking patterns and a several other projects too. I'm taking it to the printer on Monday....it won't be long now! I went to Double Cross, which is a wonderful cross stitch shop in Knoxville. I bought two embroidery hoops and needles. I can't wait to get started on my Quaker Strawberry Sampler that you gave me. Your new book looks wonderful - I can't wait to see what delightful surprises are on the inside. I can barely await the arrival of the new book. It is already on preorder at my favorite shop! Congratulations to the winners!!! I absolutely can not wait for the Halloween Stockings to be released! The cover looks wonderful. 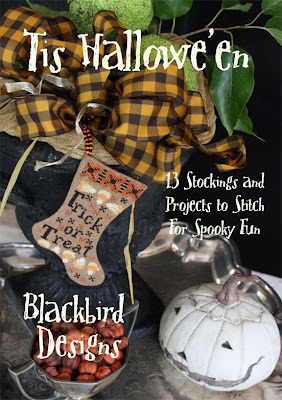 Your Halloween Stockings Booklet is looking good !! I cannot wait to get it in my hands. I have pre-ordered through my needle shop. Oooooooooh! I think I am going to die. Ilove Halloween and I simply cannot wait to get this little treat in my hands. Did I say I LOVE Halloween? The cover is just so wonderful,it makes me want more. 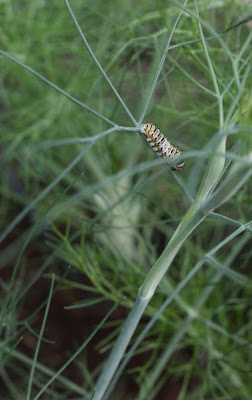 I love that you plant the fennel for the caterpillars. I haven't done something like this for years and you are inspiring me to get back to the garden to watch the insects. I love the new book and can't wait to get it and explore all the new wonders. Your garden is inspiring but it will be near 100 for the few days so no gardening this week. Besides, my sister is moving into a new house and most of my time is spent helping her. Again, I can't wait for the new book. You do such beautiful work. Thank you from the bottom of my heart. My husband and I have done caterpiller growing/watching/hatching with Monark butterflies on milkweed. I hope you'll post pictures of the chrysalis(not sure how to spell) and the hatched butterflies. 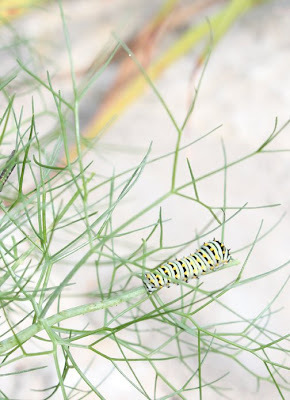 One summer we hosted swallowtail caterpillars. They gathered on my dictimus. I cannot remember if they killed it or not but I did plant a new one. I thought if it did die, it was a small price to pay for all the butterflies. I let milkweed plants grow in the yard for the monarchs but the milkweed really took over so I had to dig them out and make them stay in the meadow behind the house. Maybe I should grow fennel for them. The new book looks wonderful! Can't wait to get my hands on it and do I see a familiar face on the cover grinning wickedly I might add, lol! Way to go on the winners!! there were alot of posts so they are much deserved..LOL. Congratulations to all of the winners!!!!! The new book looks brilliants. I love the halloween quilt..imagine a new quilt for every season! If only our fabric here in the UK was a cheap as the US! What a great idea planting foodstuff for the caterpillars, butterflies are becoming quite rare in the UK now. I hope you manage to get some photos of the adults before they fly away. I'll email you my address, I'm thrilled to be one of the winners. Complimenti ai vincitori!!! Non vedo lìora di poter ammirare il tuo nuovo libro!! Can't wait for the new book! :D Love the cover! And you plant purposely to attract butterflies? That's pretty cool! I love butterflies. What a great thing to do! contrats to the winners.. your halloween stockings will sure be a hit! Looking forward to the new book! I will certainly be getting this. I hope it will be available from an online store. Sadly, I do not have a local cross stitch store. I am very excited about the new book! I've already got it pre-ordered at my cross stitch shop! Ya'll do such wonderful pieces! Congratulations to both of you on your new book launch. Sounds like it going to be a success from the comments. I know I can't wait to purchase one myself. How did your pumpkin guy survive the photo shout, he's not burnt (orange) yet is he? How long until the butterflies grow up? Congrats to the winners also. The new book looks "spooktacular!" I can't wait to get it in my little hands and see what "treats" it holds! Darn! I was on vacation last week and missed the latest competition. That's what I get for going to a cabin in the mountains away from civilization! Congratulations to the winners. Perhaps one day I'll be so lucky. I do believe that next year I will try fennel - I know that my boys will love to watch the critter show! The Halloween book looks like a fun one! I'll have to plant myself some fennel. They are lovely. I love butterflies! They come to my sage all the time when it's in bloom! Thanks for sharing! I like your patterns, but I live in Belgium, and I haven't found a place yet to buy them. Do you have sellers in Belgium, or do you sell them on the internet too? Those Halloween stockings look super cute! Totally unrelated to your blog post - I'm trying to track down a free Moda pattern that went with your Anna's Starry Nights fabrics. I have the fabrics all kitted up to make the quilt, but I have lost my pattern! 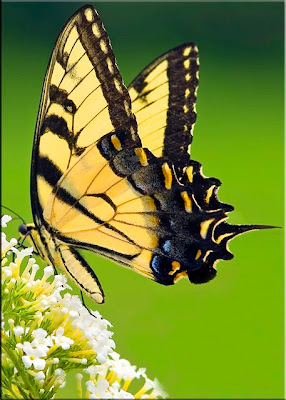 Alma, That swallowtail photo took my breath away! Just lovely. Carol - Our patterns and books are not really "how to" books. We assume most reading have a certain basic knowledge and skills. Although we try to be clear and concise in our instructions they are not really broken down for the beginner. I would recommend taking a class at your local shop and learn the basics. Then you will be ready for any of our patterns. You might try Small Favorites For All Seasons. The quilts are smaller and quickly finished. Sheri - Barb and I love your shop. It's always a fun one for us to visit. Great minds think alike. 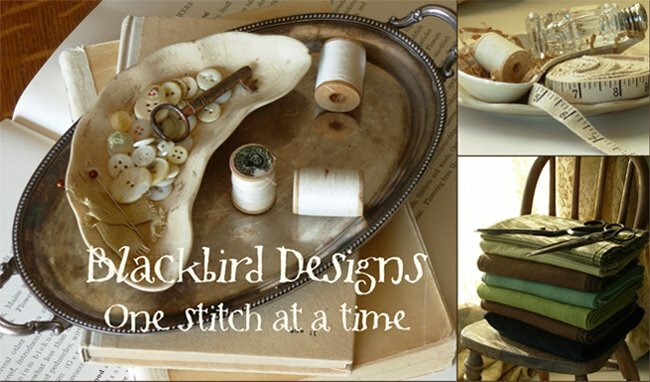 I just photographed Barb's hooked rug to post on the blog...and what do I see at your web site? The same rug. Love yours! Babs - I bet there is someone who sells the patterns in Belgium...but I just don't know right now who that would be. Sometimes the distributors send out the patterns and we don't know who purchases them. You could ask your local shop if they order patterns from American Distributors and if they do...ask them to include the patterns you want with their next order. If they can't you will probably have to order from an on-line shop. Kristin - Those caterpillars are almost grown up now. You should see how large they are! Trudy - You will have to send a picture when you and your friend have finished your quilts! Lisa D. - E-mail me and let me do some research on the pattern. Super blog, I love your articles and reports, good luck.